Bachelors take 3 Years at 400 USD per Semester Where as Diploma Courses are scheduled for 2 Years comprising of four (4) Semesters. Each Semesters Fees is only $200 (USD) Equivalent to 600,000/= Uganda shillings or to 3000 Sudanese pounds or 20,000/= Kenya shillings. 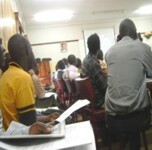 Face to Face Lectures are conducted Every Three Months followed by Assignments, Tests and Examinations. All the distance learning program have got the same fees structure of 200 US dollars for Diploma and 400 US dollars for Bachelors. Students are required to pay a down payment of at least 50 percent at the beginning of the term and the rest of the dues should be paid before sitting for the final exams. For those offering courses which require placement and field attachments, they will meet all the other dues including transport to the venue, feeding and accommodation. You can Use Dahabshil Forex Bureau branch near you or YAMAMA Forex Bureau Send your tuition to AFRICA POPULATION INSTITUTE KAMPALA – UGANDA, Use telephone +256-712-836998 to confirm your payment, then you will receive an acknowledgement receipt from us.